Login to your Prey Account through our website. Remember, due to Apple's portal interface it's best to do this process on a computer. You can find the Apple Push Notification Service tab inside the Settings menu on the left-hand sidebar. You will see the current expiration date and below you will see the How to Renew Your Push Certificate section, click see steps to begin. The renewal process is almost identical to what you have experienced before with the exception of, if you renewed it in time, not having to enroll your devices again to this certificate (if you didn't renew it in time, that process has to be repeated). Download the certificate generated by us, linked to your Prey Account, that you will share with Apple (Certificate signing request.plist). Click the image and save it somewhere accessible, like the desktop! This time, you will RENEW the prior certificate. If it expired before you could renew it, you will have to follow this guide instead as if it was the first time you created this certificate. Once you enter the Apple portal, you will see the prior certificate and a RENEW button, click it to continue. From there, follow Apple's procedure and upload the certificate you downloaded in Step 1 when requested. Apple will automatically sign and validate it. This will generate a new copy of the certificate which you have to download from Apple's website. After you download the signed certificate at Apple's portal, go back to the Prey panel tab for the third final step. 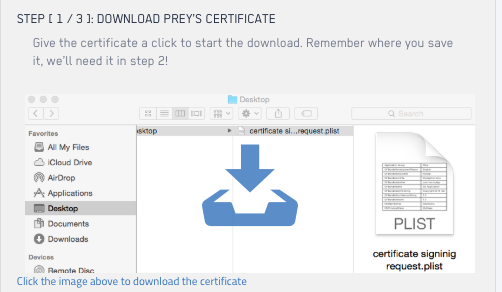 Select the certificate you downloaded in Step 2 from Apple's website and upload it to Prey. We will confirm it and validate the renewal for the period of 1 year. Presto! You have renewed your Apple Push Notification certificate. 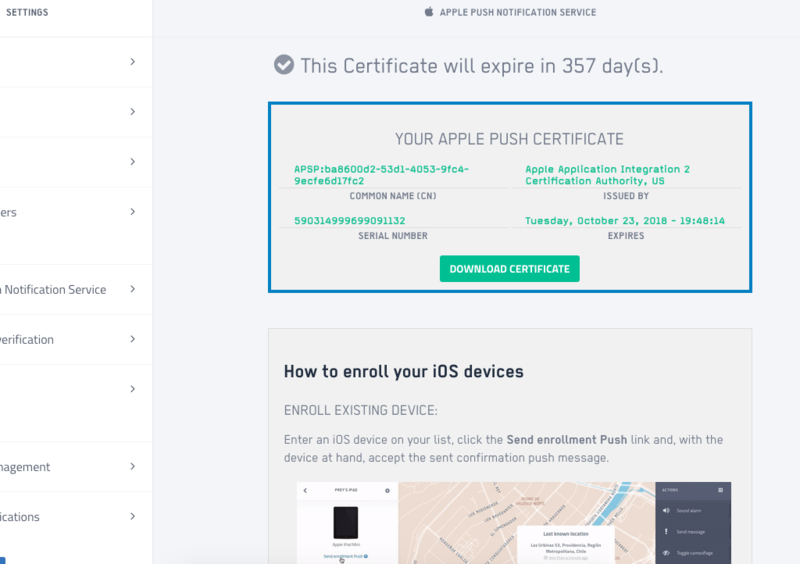 If you did it before you expired, you won't need to enroll your Apple devices again to the certificate. However, if it did expire you can read the following article to follow the Enrollment Process again.